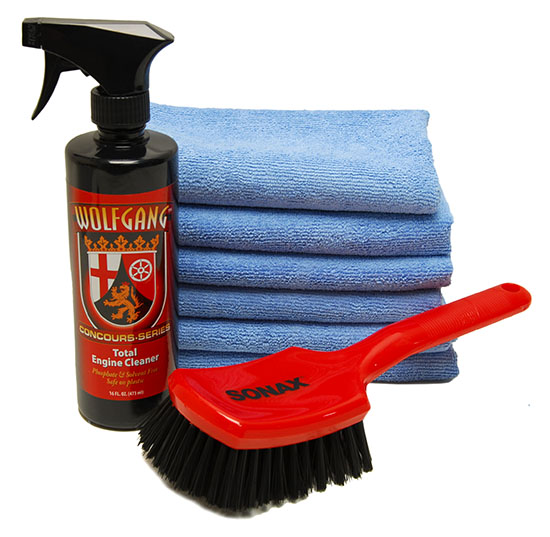 The Wolfgang Total Engine Cleaning Kit has all of the basics for keeping your engine bay clean and tidy. This perfect combo includes the safe and effective engine cleaning formula found in Wolfgang Total Engine Cleaner, along with the SONAX Intensive Cleaning Brush, so you can reach every inch of your engine compartment with ease. The Wolfgang Total Engine Cleaning Kit also includes a handful of microfiber towels, so you�ll have plenty on hand for your next engine detailing session. The SONAX Intensive Cleaning Brush is a safe and effective brush for cleaning just about anywhere in or around your vehicle. Featuring hundreds of nylon bristles that offer just the right amount of bite to clean without causing damage, this brush is a must have addition to your detailing tool box. The SONAX Intensive Cleaning Brush, with its ergonomic handle, is perfect for use on wheels, tires, upholstery, and lots more! The Microfiber All Purpose Detailing Towel is absorbent and soft. It will not scratch any finish, including factory clear coated or painted wheels. The 80/20 blend of polyester and polyamide is extremely tough. It's a great towel for detailing under the hood or wiping down door jambs. Remember, If you use a Microfiber All Purpose Detailing Towel on the wheels or engine, do not use that towel on other portions of the vehicle to prevent cross-contamination.